Before we get to The Ruined City coming out in June, we’ve got another release coming soon to DriveThruRPG just for you! The Journal of Array Design will collect every array we have posted thus far in a neat and tidy pdf format, categorised for your convenience. If you have ever thought about using the arrays we post in your game, it will now be so much simpler with everything you need in one document, right at your fingertips! This will be the first volume and you know that means there will be more! After this volume, we will start collecting all our arrays together until we’ve gotten enough for a second volume. And if you have ever wanted your magic out there for the world to see, well here’s your chance to have your own array designs included in volume 2. 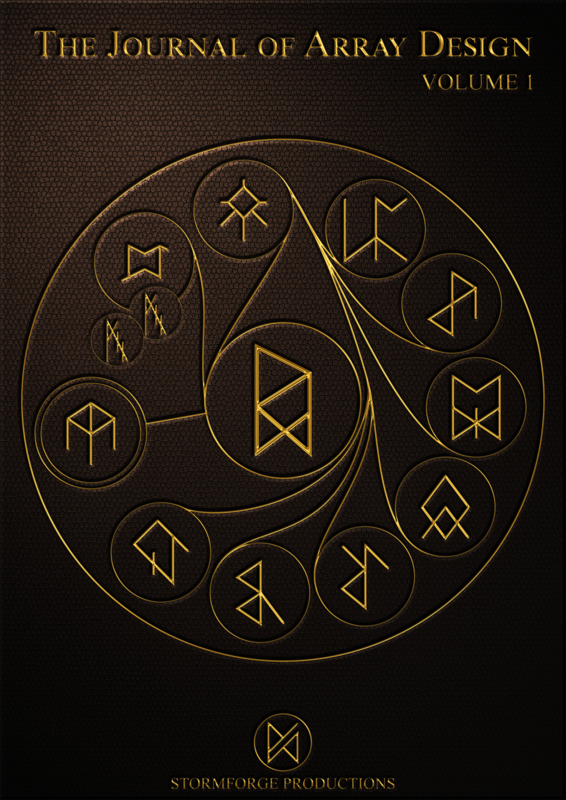 Simply send us the array and a description and your name will go down in history along with the greatest of mages, wizards and sorcerers and having taken part in the writing of a spellbook! And to add the cherry on the top, the Journal of Array Design will be completely free! It’s a gift from us to you to make your games all the better. Posted on February 24, 2016 May 12, 2016 Categories Announcements, UncategorizedLeave a comment on Coming Soon! This week we give you a sneak peak at a very important array that will be used in the Ruined City, the first campaign for the Runed Age coming out in June. This week we give you The Prophet’s Blood Array. Notation: Transmute Copper, Gold, Iron, Lead, Silver, Tin and Wood into Water. Create Light and apply this to the transmuted Water. Description: Last week we had a defensive array focussed on fire and this week we have one focussed on water. Other than the opposite elemental natures of the Flame Ward array and The Prophet’s Blood array, there is also a significant thematic difference. The Flame Ward is the epitome of defence by offence.  The Prophet’s Blood is defence by unyielding will. From a purely defensive point of view, this array could have stopped after transmuting the materials into water. At that stage whatever needs protecting has been protected. Other than a clever technical use of the array, the secondary array that creates light plays a vital psychological role in the defence that this array creates. The secondary array simply creates light, but by applying this effect it means that all the water in the area of the array’s effect creates light. This in effect means that this array creates glowing water. At first glance, creating glowing water may not seem at all to be much of a psychological advantage, but have a second think about it. Imagine that you have just been shot and rather than seeing blood spurt out (or noticing anything at all because your Middelburg Standard saved you) you see a patch of brightly glowing liquid. You know for a fact that your life had just been saved, you know your arrays work and you know the enemy just wasted a shot. If you were of a religious persuasion, you might also see it as your divinity of choice literally taking a bullet or blade for you. I would say that would put a spring in any man’s step. As to your opposition, the psychological effects depend entirely on being ignorant of The Prophet’s Blood. If you didn’t know this array existed you would see a man you just shot bleeding light. You don’t even have to be of a religious persuasion to see this as something supernatural, something otherworldly. It would be even more of a fright if this enemy expected this to happen and is even glad to see it. What sort of monster would be glad to see itself glowing blood? More than one man in Middelburg has thought that discretion is the better part of valour after shooting someone with The Prohphet’s Blood. On the other hand, it must be said that this array comes with a glaring flaw. By creating glowing water, it is also painting a target onto whomever is bearing the array. Once one shot connects, every other shot is sure to follow. This array is definitely not made with prolonged combat in mind. It is for those who prefer the shock and awe approach. This week we begin a new series of character sheets for you and, due to popular demand, we are taking a look at the Inhumans who began the Great War nearly 2000 years ago. Only one of the six Inhuman species still survive to this day, the giant Ogres, but if you are keen on playing some sessions set in the mythical times of ages past, then these will definitely help you. First up this week are the Sauddyr! The Sauddyr are perhaps the closest in stature and abilities to humans and as such you can see they range in Skill Levels from 30 – 100 just like regular humans.  The only skill where they are worse than humans are of course Runes, which start at 0 but can, if the Sauddyr study hard enough, reach 100 like regular humans. Some excerpts from The Runed Age Corebook about the Sauddyr. Posted on February 19, 2016 May 12, 2016 Categories Character Sheets, Lore, UncategorizedLeave a comment on Inhuman Fridays! This week for Magic Mondays, we bring you an explosive defensive array. Today we give you the Flame Ward array. Notation: Transmute Copper, Gold, Iron, Lead, Silver, Tin and Wood into Fire and Push the Fire at a speed of 4m/s. The Fire excludes Water. Description: An unsubtle name for an unsubtle array. The Flame Ward array takes the idiom of “a best defence is a good offence” to heart and makes every attack on the bearer of this array a lethal risk. At its core, it is a very simple array. It transmutes a variety of materials (those most often used to create weapons and projectiles) into fire. As a defensive array, this is par of the course. You can have the array transmute the materials into air, light, sound, water and it will protect you just as well. The Flame Ward, as its name implies, has a specific use for the fire and that is to fling it back at the enemy. After the materials have been transmuted into fire, this fire is then pushed away from the array at a speed of four metres per second. This shows how this array was meant to be used on shields for melee combat, since if you are within striking distance of a person, you are definitely within four metres and that means a ball of flame will take less than a second to make it back to you. For ranged combat, this array is less than ideal. Over any significant range, the fire will take far too long and will die out before it hits the attacker, although a skilled user might be able to angle to fire to a closer enemy. At the very least, the array will still protect you from incoming projectiles. The other unique bit about this array is that the fire excludes water. This means that while the fire is inside the array’s area of effect, it cannot touch water. Not useful until you remember that this means that water cannot touch it either, meaning it is unquenchable as long as the fire remains inside the array’s area of effect. Today is the last of our Animal Friday series where we give you some animal character options that you can use in your games. First we gave you man’s mighty steed, then we gave you man’s valiant hound and last week we gave you man’s ferocious foe. This week, us humans become the predator. This week we give you our third animal: the noble stag! Much like last week’s bear, the stag won’t often be seen in Middelburg outside a butcher’s, so you will have to travel deep into the woods to find this majestic creature. One thing that is immediately apparent is how close the stag’s profile is to that of the horse from a few weeks ago. That is not just a coincidence because horses and deer share a few similarities. There is a very game-y, mechanic-y reason for this. If you remember three weeks ago with the horse character sheet, horses aren’t quite what they seem in The Runed Age. Rather than making horses by breeding small ponies selectively like we did in the real world, the humans of The Runed Age selectively bred goats to make their horses, meaning the horses in Middelburg, and elsewhere in the world, have horses, tufts of hair on their chin and are remarkable climbers. However, not all cultures went the way of the goat for their mounted animal needs. The Tolians and some Uttosian cultures instead ride domesticated stags. Among the Tolians, the reindeer is the most coveted mount, but they domesticate and ride many kinds of stags. So, if you are playing an Uttosian, a Tolian, or perhaps a northern Westerner or Cael that grew up close to the Tolian borders, you might well be more experienced riding a stag than a horse. If that is the case, feel free to amaze the people of Middelburg by bringing a stag into the city. You will surely be the talk of the town. Just make sure no one thinks you’re bringing the stag to slaughter! That’s it for the animal kingdom. 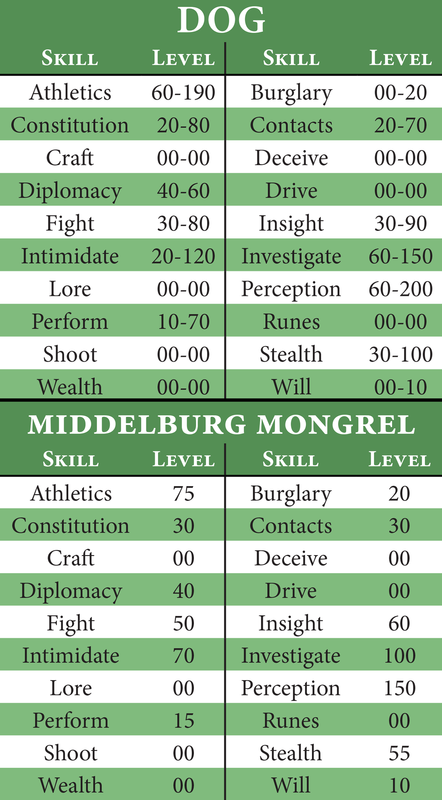 Yes, there are plenty of animals still out there, but none that you will meet in Middelburg or its surroundings that need a character sheet for the game. Next week we start a new series that will take you back 2000 years to a time of myths, legends, heroes and when monsters still walked the lands! Posted on February 13, 2016 May 12, 2016 Categories Character Sheets, Lore, UncategorizedLeave a comment on Animal Fridays! There are many ways to kill an enemy in The Runed Age and most of these are cruel and inhumane… and here’s one more to add to that list! This week we give you the Hatchling array. Notation: Create a cylinder of Iron as wide as the array’s circumference and 100 times as tall if a Human is present within a distances one tenth of the circumference of the array. Description: To understand the Hatchling, one must first understand how it is used. A Hatchling array is always carved onto a sphere and hurled at an enemy in some form or manner, whether it be thrown, catapulted or shot by cannon, pistol or musket. The array is always carved six times across the sphere for maximum effect (one on each front, rear, both sides and top and bottom of the sphere). When it reaches an enemy, that enemy must then touch it. If thrown or catapulted, this usually happens because the enemy picked up the sphere not knowing what happens. The most desirable effect, however, is if the sphere is inside the enemy.  Once the enemy touches the sphere, a cylinder of iron erupts from the sphere, skewering everything in its path, first and foremost being the enemy. If it is on a musket or pistol round, then all six iron cylinders shoot out at once in all six directions, “hatching” from inside the enemy. This is not however where the cruelty comes in. Hopefully, for the enemy’s sake, they have died by this, but if they have not, then they have six iron cylinders sticking out them. If the array was inscribed on a musket or pistol round, these cylinders are more than a metre in length! Now that the enemy is looking like a porcupine, he will not be able to move 9 times out of 10, meaning that the next shot to kill him will be far, far easier. And that is why this array was designed: to incapacitate enemies it could not kill outright. First we gave you man’s mighty steed and last week we gave you man’s valiant hound. This week, however, we aren’t giving you a pet to play with. This week we give you our third animal: the ferocious bear! Definitely not an animal you will encounter in your daily life in Middelburg, except for a pleasant trip to the zoological gardens, but there is more to Alfresia than just one city. If you ever think of venturing outside Middelburg, especially on foot, you better beware because the east-Fresian brown bear is powerful and ornery creature. Middelburg, as it name implies, sits between two mountain ranges. Should you leave the city by any means other than boat, you will find yourself in the highlands and that is where the native brown bear makes it home. In recent times there has been a decline in the bear population as the roads become more frequently travelled, but once out of sight of civilisation you will find more than enough to keep you occupied. For the purposes of gameplay, bears are incredible combatants. With a minimum Constitution of 60 and Fight of 70, you have to be particularly brave or stupid (or both) to take on a bear single handedly. If you think running away will help you, you might forget that an angry and hungry bear is one of the fastest things on four legs and with an Investigate and Perception minimum of 40, you will be hard pressed to escape it. A bear is a dangerous beast, so act accordingly. Posted on February 5, 2016 May 12, 2016 Categories Character Sheets, Lore, UncategorizedLeave a comment on Animal Fridays!  For Magic Mondays this week there will be no devious offensive arrays or cruel bombs, but rather a tool that you can use in your games. This week we give you the Phantom Cell array. Notation Top Array: Send Human within an area twice the size of the array, if Antimony and Sulphur is present. Notation Bottom Array: Receive Human from within an area twice the size of the array, if Mercury and Arsenic is present and Pull Human. Description: The Phantom Cell is an example of what can be done when you combine the arrays with technology. At first glance the arrays seems quite simple: they simply teleport a human from one array to another. However, it is the details of it which can confuse you if you don’t know how it is used. The arrays only send and receive within a very short distance, they have to be right next to each other, so it seems a rather useless teleport array. Not to mention the odd requirements for activating it: antimony and sulphur to send and mercury and arsenic to receive? Seems rather restrictive doesn’t it? Not the sort of thing you would carry around every day. It just doesn’t look like something you can use in combat or any other rushed situation. That is until you know how it is used. The Phantom Cell is inscribed onto two metal plates not much larger than the palm of your hand and held inside a metal “booklet” that can fold closed for easy carrying. This metal booklet also holds four vials for the four triggers and handy little levers that, when pressed, will empty the contents onto the send or receive array. So now you have a booklet that can send and/or receive a human at a push of a button. But why would you? The answer is quite simple. To send anything, the send array needs to be powered. That much is obvious, but it also is true for the receive array. If the receive array isn’t powered then it doesn’t receive. So, you might be thinking, what happens to something when it is sent but the receive array isn’t powered? The answer is that whatever is being sent, a human in this case, is caught inside the receive array and kept there until it is powered. No time passes for the person inside the receive array and they can stay in there for as long as the array remains intact, but if the array breaks the person disappears forever. So what does this mean for the Phantom Cell? Well simply put that, by pressing one of the levers on the metal booklet, you can capture someone within the array and leave them there until you have need of them. The Phantom Cell is exactly that, a prison cell that doesn’t actually exist. Last week on Animal Fridays we gave you the character sheet of man’s mighty steed. This week we give you man’s best friend, and not only that, we give you the breed that you will most commonly find on the dirty streets of Middelburg. This week we give you our second animal: the valiant dog! 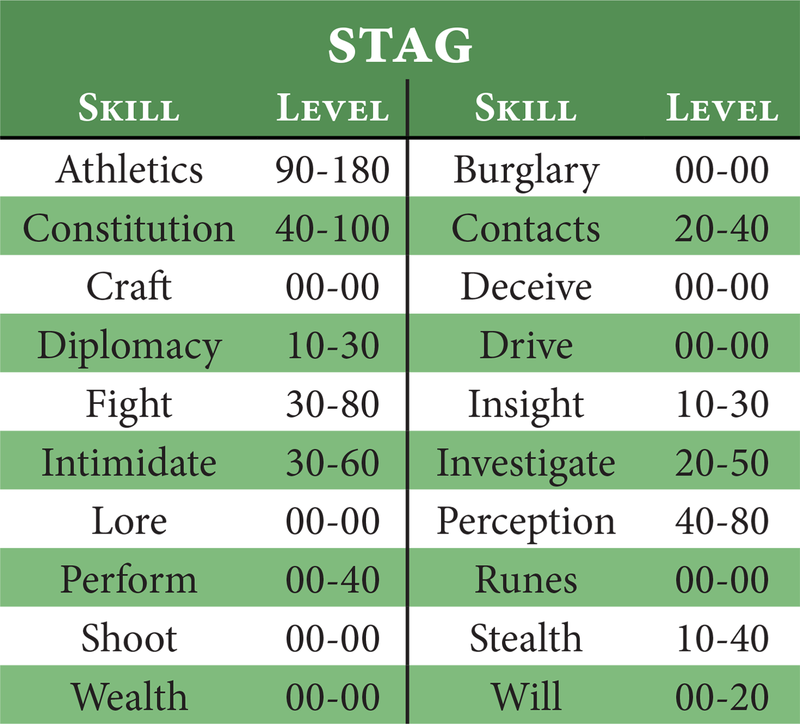 If you compare the top character sheet of the DOG with last week’s HORSE sheet, you will find that there is a far, far larger range of skill levels for each type of skill. This is because, while horses were trained mainly only to pull things and carry things, different breeds of dogs were bred for their own purposes. We have hunting dogs, ranging dogs, guard dogs, show dog, companion dogs, sniffer dogs, all sort of dogs! The other thing to notice is that there are quite a few skills that break the 100 skill level cap of humans, most notably Investigate and Perception. It is simply the case that the senses of dogs are unbelievably better than that of a human; the sense of smell of sniffer dogs can be up to 6000 times better than a human’s sense of smell. The second, lower, character sheet is the breed of dog most often found in Middelburg and the dog you will encounter 9 times out of 10 in the city. The Middelburg Mongrel, otherwise known as a City Mutt, is just that, a mongrel of dozens of different breeds of dogs all mashed together over the centuries. No one is sure anymore which breed forms the base of the Mongrel, all they know is that the shaggy, drooling thing can be found everywhere, and if you aren’t careful the feisty things can get quite aggressive and they know which part of the human body to target. Posted on January 29, 2016 May 12, 2016 Categories Character Sheets, Lore, UncategorizedLeave a comment on Animal Fridays! The arrays can do beautiful and wonderful things, but they can be deadly, cruel, and horrifying as well. This week we show you a dark side of the arrays. This week we give you the Crypt’s Breath array. Notation: Create Arsenic if Stone is present within the area of the array’s effects and Heat Arsenic at a rate of 512 degrees Centigrade per second. Description: Much like the Peace of Mind array, this array deals with arsenic as an offensive weapon, and much like the Peace of Mind this array gives a cruel death to all those it meets. 300 milligrams of arsenic in the blood is a lethal dose. At such doses and beyond, symptoms appear within 30 minutes and include confusion, dizziness, vomiting and diarrhoea. Then comes convulsions, cramps, pigmentation colouring, blood in the urine, hair loss, troubled breathing, immense pain all before collapsing into a coma less than 24 hours later and soon after. This array can provide doses of arsenic that merely being in its presence is a death sentence only a few hours after exposure. Arsenic in its natural form is a dull grey metallic crystal, however when heated to above 887 degrees Centigrade, it can sublime and turn into a gas. It takes less than two seconds for this array to reach that temperature and that is its purpose: to create an arsenic gas that the enemy will inhale and then succumb to arsenic poisoning. Throw this into a crowded room and you won’t even have to get your hands dirty. Arsenic gas smells only faintly of garlic and that is the only warning your enemies will have. The trigger for this array is Stone, but that can be changed to whatever you need. It’s purpose is only to make sure the array can build up the required energy it needs. Heating something up at the rate of of 512 degrees Centigrade per second requires a lot of energy after all. This array is most often inscribed on a metal ball and either thrown or shot by a cannon where it needs to go, so you can think of this as a poison grenade. Our new project for Fridays is to give you some character sheets of things you might not have thought about using in your games. Specifically, animals! Yes, our furry and feathered friends can have character sheets of their own, and can even have wound slots and hit locations! 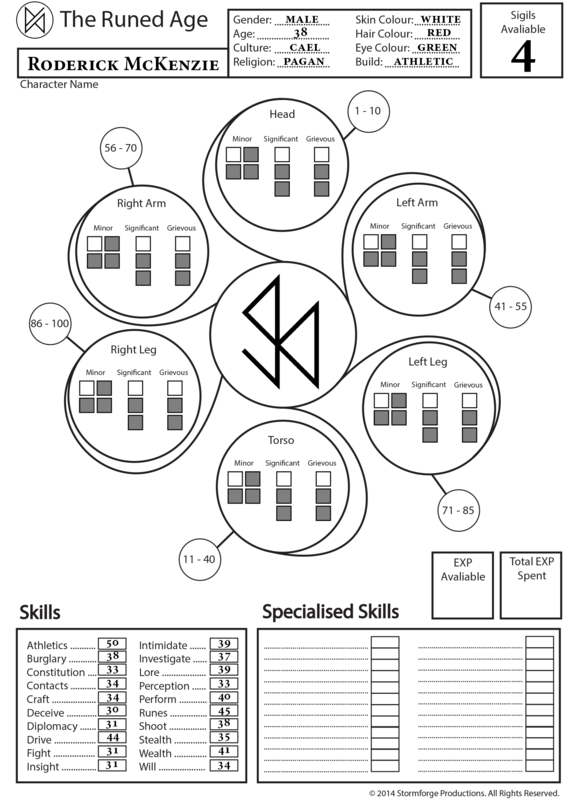 The character sheets will be giving you over the next few weeks will be the truncated tables rather than full character sheets for humans just to make it easier to get your head around. 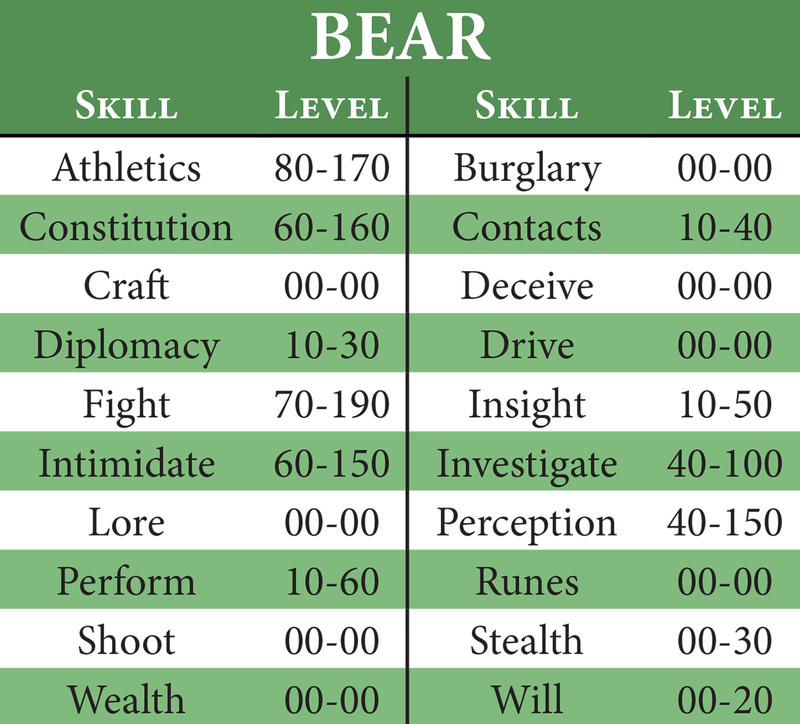 Each of the Skill Levels in the tables will also be given in a range rather than a fixed number, because each breed of an animal will be different in characteristics so you can play around within that range to create the animal you want. It will also allow you to increase the skills of any animals you own over time, just like with humans. With all that said and done, here’s our first animal: the trusty horse! 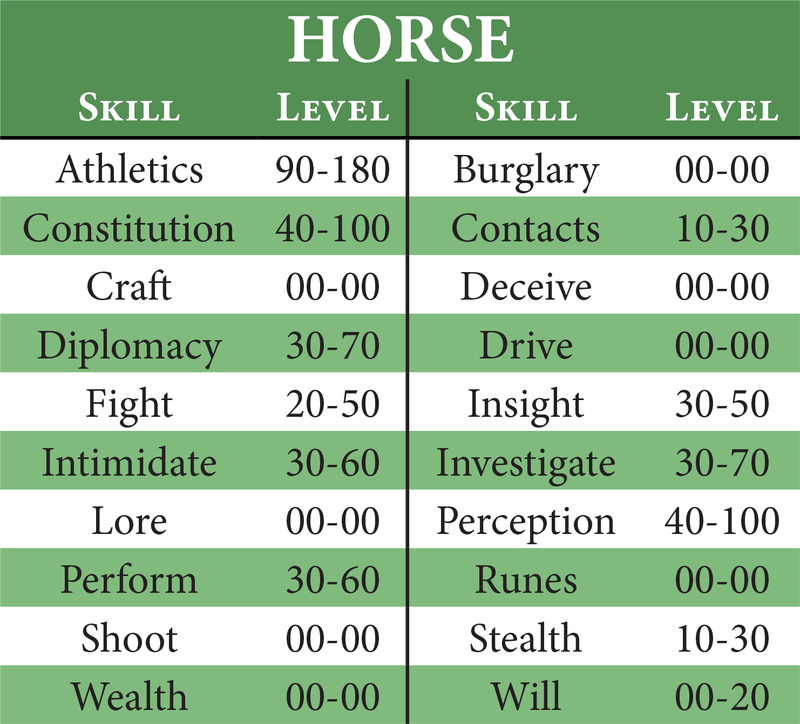 While the horses the people of Middelburg and the wider world of the Runed Age are very similar to ours in the real world, there are a few differences. The main one and most obvious are the horns. Yes, horses in The Runed Age have horns like goats as you will see in all the images of horses in the corebook. This is because what the people of the Runed Age call horses evolved from goat like animals. This means that the horses you will find in the game are slightly shaggier than our real world horses, are better at climbing, and have some magnificent horns. One of the key ways of distinguishing breeds of horses are by the shape and size of their horns. The Fresian horses have curled horns much like sheep and quite shaggy fur, while the desert horses of the Neoist western states have sleek, soft fur and long straight horns. The horns are not only just for decorative purposes as the animals use these horns in their mating displays and can actually be taught to use them in combat. Warhorses often have their horns covered in sharp, thick metal and taught to run headfirst into enemies. Many a massgrave are filled with dead humans stuck onto the heads of dead warhorses. Posted on January 22, 2016 May 12, 2016 Categories Character Sheets, Lore, UncategorizedLeave a comment on Animal Fridays! Some of you asked for this and we thought it was a brilliant idea, so we did it. 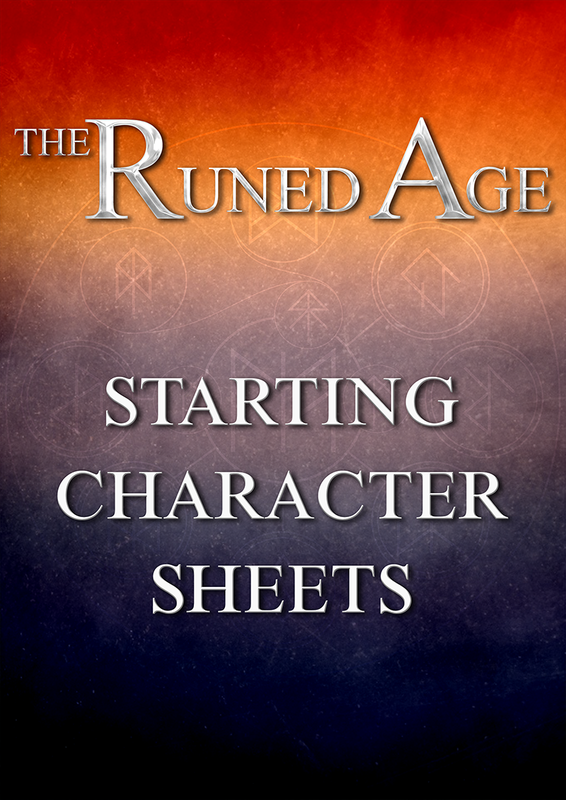 All the character sheets we showed you over the last ten weeks have been bundled together as pdfs and is available on DrivthruRPG for free! Each pdf is editable, meaning that you can type on it and change anything that’s written there. So you can update your characters as you play them. 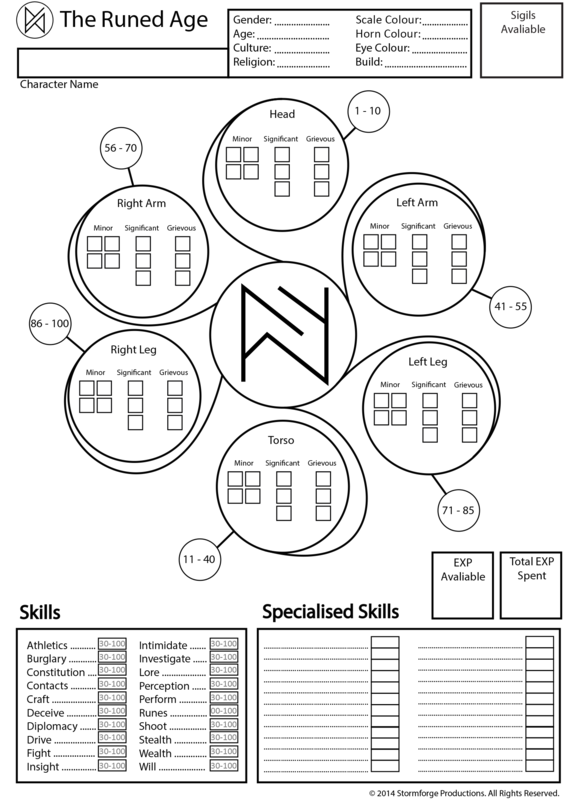 We’ve also put in a blank character sheet that you can use for your own original characters. A tad late but it’s better late than never as they say! This week’s array is for those of you who prefer to get up close and personal to your foes. This week we give you the Furnace Fist array.  Notation: Create Fire if Animal or Wood or Stone or Iron is present within the array’s field of effect. Description: It’s symmetrical, it’s simple, it’s easy to understand. What more could you want from an array? The name immediately gives away the purpose of this array, furnace and fist can mean only thing: fire punches!  Arrays like these are often found on knuckledusters, gauntlets, or even tattooed onto a person’s knuckles. The key to this array, and other like it, is not what is created or even what triggers, but how it is triggered.  There are four different Create runes with four different triggers (although you can add many more than this), and it is of the utmost importance to have it arranged like this, because it means each trigger works independently.  If you had two or more triggers attached to the same Create rune, that rune would only activate if both triggers are set off; it becomes a “this and that” trigger rather than a “this or that” trigger. Like all arrays with If-Then statements and triggers, the Furnace Fist array gets its effectiveness from the triggers. Until one of the triggers is activated, this array will continually absorb energy from wherever it can find it: heat, light, kinetic energy, etc. So that means when you do punch someone with this, it’s not just the energy from your punch which determines how much fire is created, but all the energy it has stored up until that punch. Today is the tenth and final character for our Character Friday series! Now you have ten completely different characters to get you going in the mad city of Middelburg. This last character one from perhaps the other side of the fence that you are used to. This week’s character is the wealthy constable Roderick McKenzie. Born one of seven redheaded children to powerful clan lord in the Caelish nation of Ullacht, Roderick always knew life would be fairly easy for him. He wasn’t the oldest, so there were quite little expectations of him, other than hanging around the grand castle and annoying the courtiers. Even the fact that his family worshipped the old pagan Caelish gods didn’t bother him, as his family’s wealth was more than enough to soothe any zealotry in the countryside. Roderick’s easily life continued well into his teenager years where is father found him a place at a duke’s court as a page. Here he learnt politics, subtlety, intrigue and found both a best friend and a sweetheart in the duke’s son and daughter respectively. Compared to the harsh childhood years of the underclasses, Roderick’s first seventeen years were quite unremarkable. The one and only thing that roused him from his lazy reveries were the gift he received from his father: his family ancestral sword, born by McKenzie men since Kenzie the Great walked the living lands. Roderick found in the blade a sense of duty and soon after enlisted with the constabulary. Of course, not just any constabulary would do for the son of Lord McKenzie, and so Roderick became part of the political security of the politicians of Ullacht. A well paying job, a safe job, but a boring job. Roderick enjoyed it, the lazy man he was, but found his talents going to waste. It was through his political connections that Roderick finally came to Alfresia as he became the bodyguard of the Ullacht ambassador to Alfresia. In Middelburg he found a faster pace of life, but an exciting one at that and soon grew to love everything it had to offer. Joining up with the Middelburg constabulary, he now works in the Political District, keeping it safe and clean from the wretchedness of the poor. Roderick is a man who prefers the easy way than the right way of doing things and have quickly joined the ranks of Middelburg’s corrupt constables. A little extra money in his pocket and he is quite able to look the other way. Less work, more money. A narcissist at heart, Roderick never found a soulmate and he is fairly certain he doesn’t have any bastards around although he can’t be sure. What he can be sure of though is that he enjoys life and all it has to offer. That’s it for Character Fridays! Next Thursday we’ll be bringing you a different sort of characters, ones you might not immediately think of using in your games.